When dealing with mysteries that are embedded into hit TV shows, it’s the one that’s embedded into perennial animated favorite The Simpsons that stands high above the rest. The mystery? WHICH Springfield, exactly, does this never-aging family reside in?! OK, so perhaps it’s not all that important a mystery. Still…the question evolved into a long-running joke which has maddened fans for the over two decades the show has existed, leading many to go to great lengths just to figure out where it might be. Instead of going through all that, as it turns out, the way to find out which Springfield is the right Springfield was to just be very patient and wait for creator Matt Groening to tell us the answer. Whodathunkit? 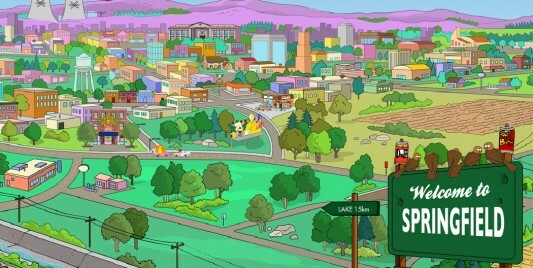 “Springfield was named after Springfield, Oregon. The only reason is that when I was a kid, the TV show ‘Father Knows Best’ took place in the town of Springfield, and I was thrilled because I imagined that it was the town next to Portland, my hometown. When I grew up, I realized it was just a fictitious name. I also figured out that Springfield was one of the most common names for a city in the U.S. In anticipation of the success of the show, I thought, ‘This will be cool; everyone will think it’s their Springfield.’ And they do. Congratulations, Springfield, Oregon…you are officially the Chosen One of all Springfields; the Neo of them all. Be sure to head on over to the Smithsonian website for the lengthy interview, where Groening shares many more inspirations for The Simpsons, its characters, and its locations.